"I made a poor decision and I'm willing to take full responsibility"
This Nov. 11, 2018, file photo shows Kareem Hunt of the Kansas City Chiefs carry the ball during a game against the Arizona Cardinals at Arrowhead Stadium in Kansas City, Missouri. Running back Kareem Hunt acknowledged that he misled the Kansas City Chiefs about his role in a February assault in a Cleveland hotel that ultimately led to his release this week. "They believed that I lied to them. I lied to them," Hunt said. "They pretty much said we love you, everybody cares about you, and just we have to let you go. It was a tough conversation. And the Chiefs did what was right. I made a poor decision and I'm willing to take full responsibility." In the grainy, graphic video, Hunt is seen getting into an argument with a woman and several men step in to hold him back. He later pushes one of the men, knocking down a woman that Hunt admitted he did not know, and eventually kicks her while she lays on the ground. "The Chiefs are right. I didn't tell them everything," Hunt said. "My actions caused this and I really wish I could apologize to them and let them know there's no hard feelings." The video brought immediate comparisons to the footage of former Ravens running back Ray Rice , who was seen punching out his then-fiancée in an elevator. That incident led to a lengthy legal saga, and it culminated in an investigation by Robert Mueller into the NFL's mishandling of it. The NFL made multiple attempts to obtain the video of Hunt, but the hotel said corporate policy only allowed footage to be given to law enforcement. The NFL then contacted Cleveland police, but the department said Saturday it did not pursue the video because it was not a felony-level case. When asked whether the NFL spoke directly to Hunt about it, he replied: "No, they have not." The league uses a standard investigative process in such cases in which witnesses, complainants and the police are contacted before the player is. Because the complainants never responded to NFL requests via email, text messages and formal letters, the police decided not to bring charges against Hunt, and Hunt spoke with the Chiefs, the NFL did not interview him. The NFL said in a statement Sunday that its investigation began immediately after the incident in February and that the league "continues to pursue a complete understanding of the facts." "The NFL's ongoing investigation will include further attempts to speak to the complainants involved in the incident," the statement said. "It will include a review of the new information that was made public on Friday — which was not available to the NFL previously — as well as further conversations with all parties involved in the incident." The statement did not say whether the league attempted to contact Hunt. Hunt said he'd just purchased an apartment in the Cleveland hotel and had several friends over, and that he did not know the woman involved in the assault. Hunt said the argument came at the end of "a long night" and that "it was just a disagreement. I honestly wanted her just to leave." "That's not an excuse," he said. "I'm not that person in that video." Hunt pointed out that he was raised by his mother and grandmother, and they "they always taught me well. I know right from wrong and I'm a person that always wants to make everyone happy." "I regret the entire thing, everything," Hunt said. "I'm going to take the time to better myself, learn from this, get some help if needed, talk to people and really just take this really serious." Hunt admitted that anger "could be an issue" and that he wants to get treatment, and Rice told NFL Network on Saturday that he would offer his help and experience in moving forward. "I would definitely try to help him figure out, 'How can we start dealing with the underlying problems in your life?'" Rice said. "He has a long life to live, this will be a defining moment, but it shouldn't be the moment that defines you." Hunt said he isn't sure that another NFL team will give him a chance, though adding a 23-year-old standout could be worth the public backlash for a team in need of help. 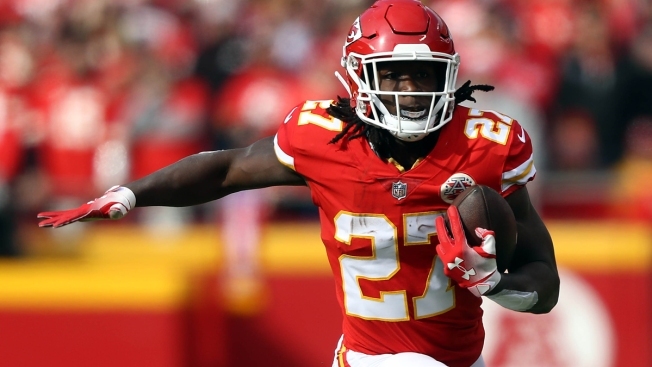 After leading the NFL in rushing last season, Hunt had already run for more than 800 yards while scoring 14 touchdowns in helping the Chiefs to a 9-2 record. He also had proven to be a popular player in the locker room, often attending sporting events and other functions with his teammates. Of course, that was before the hotel security video surfaced. Hunt remains on the exempt list, which means a team could sign him but he would be unable to play or attend games until the league's investigation is complete. The Redskins made a similar move — and accepted the public backlash — when they signed linebacker Reuben Foster, who had been cut by the 49ers after he was arrested on suspicion of domestic violence. Foster also remains on the exempt list and the Redskins have acknowledged he may never play for them. But by signing him, they retain his rights should he make it back to the field. "Everything is happening fast right now and I just want everybody to forgive me," Hunt said. "I know it's going to be hard. I made a bad choice. ... I think I deserve it because if you really know me, and everybody that I'm really close to — I've had really close women who are friends — I'm so respectful to everyone. I made a bad decision at that time and I just hope that people forgive me."